If you have tile flooring in your home then you’re already aware of how dirty the tile and grout can get over time. Keeping your tile properly maintained is essential to maximizing the look and the lifespan of your tile flooring. Experts in the industry recommend having your tile cleaned by a professional every 1-2 years, depending on the amount of traffic they get. 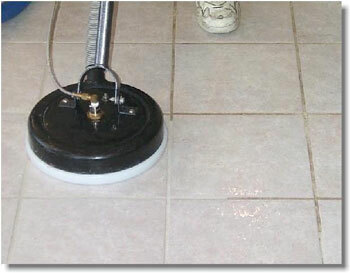 When it’s time to get your tile cleaned, Steam-A-Way is the best choice for homeowners in the Omaha and Lincoln areas. So give us a call at today. One of our super courteous staff members will be happy to give you a free estimate or set you up with an appointment to get your tile floors looking their best! Our Steam-A-Way technicians begin every tile and grout cleaning job with a full visual inspection that includes checking for any damage to all the tile and grout areas and testing for sealant on the grout. During this process you will be able to point out any specific areas of interest that may require a little extra attention or care. Upon completion of the inspection we will pre-spray the areas with solutions that break down the grease, oils, and dirt that have accumulated since your last cleaning. These solutions are then agitated and then rinsed with high pressured, hot water from our truck-mounted machine, leaving your tile floors clean as a whistle. From here we can seal or even dye your grout, if necessary. The process we use is very effective for removing nearly any type of everyday staining, dirt, or oil. Grease and other types of food and drink remnants are easily cleaned up. Even pet stains, such as urine, are successfully eliminated. Keep in mind that even though our tile cleaning process is very effective, the success of any type of cleanup will depend upon, not only the type of stain, but also the length of time it has been left unattended. This is why it is very important for every tile owner to implement his or her own maintenance routine. Clean up spills as soon as they happen and make sure to sweep and mop at least once a week. At Steam-A-Way we utilize state-of-the-art tile cleaning equipment and products, and our technicians have the knowledge and expertise to use them correctly and effectively. We take pride in our results and all our work has a 100% Satisfaction Guarantee. So give us a call at 402-331-1634. One of our super courteous staff members will be happy to give you a free estimate or set you up with an appointment to get your tile floors looking their best!